The Finger Lakes region in Upstate NY attracts thousands of tourists each year. I could easily list 100 reasons why the Finger Lakes is worthy of your affection, but for time’s sake, I’ve narrowed it down to the top 5. Growing up in Rochester, NY, I’ve been spoiled with living so close to the Finger Lakes, practically in my own backyard. I have countless memories with summers spent boating on Canandaigua Lake, going on wine tours of Seneca Lake with girlfriends, and marrying the love of my life in Geneva at a winery with the most epic backdrop, Ventosa Vineyards. Whether you love the outdoors, enjoy tasting new wines or beers, are looking for your next foodie exploration, or just want to feel on top of the world, Ontario County in the Finger Lakes is your next destination. The Finger Lakes were created by receding glaciers that formed eleven ‘finger shaped’ lakes spread across Central NY: Seneca Lake, Canandaigua Lake, Honeoye Lake, Hemlock Lake, Canadice Lake, Skaneateles, Otisco, Owasco, Cayuga, Keuka, and Conesus. Each lake has its own charm and beauty, and the best way to truly understand the natural splendor of each one is to experience them in person. Standing lakeside watching the sunset, all your worries subside, and you remind yourself you need to come visit way more often. The above photo features Canandaigua Lake, aka the ‘Chosen Spot’, my go-to lake for any type of outdoor or water activities. When the sun is shining and the weather is HOT, you can find me cooling off in this lake. Whether you like to swim, kayak, paddle board, boat, or just want to stick your toes in the water, this is the lake to do it in. Not only is it scenic and beautiful, but the water always looks so fresh and clean. Hit up Kershaw Park, a sandy beachfront to swim with your family or friends. For other Finger Lakes beaches and ideas on where to swim, visit here. Finger Lakes is notorious for ‘cool climate’ wines, producing a wide range of wines from Rieslings to Gewürztraminers (pronounced Ger-VERTZ-trah-meener), cabernet francs, sparkling wines, ice wines, and even Port wines. There is a stigma that exists, that the Finger Lakes area only produces sweet white wines—but I am here to prove that stigma wrong and tell you that there are marvelous dry whites and reds that do exist in this region. FLX Winemakers are honing their craft and more of these wines are appearing on renowned wine lists all around the world and this area is getting recognition it deserves. You can try these wines at an approachable cost at $5 or less per flight. Not a wine lover? No problem. 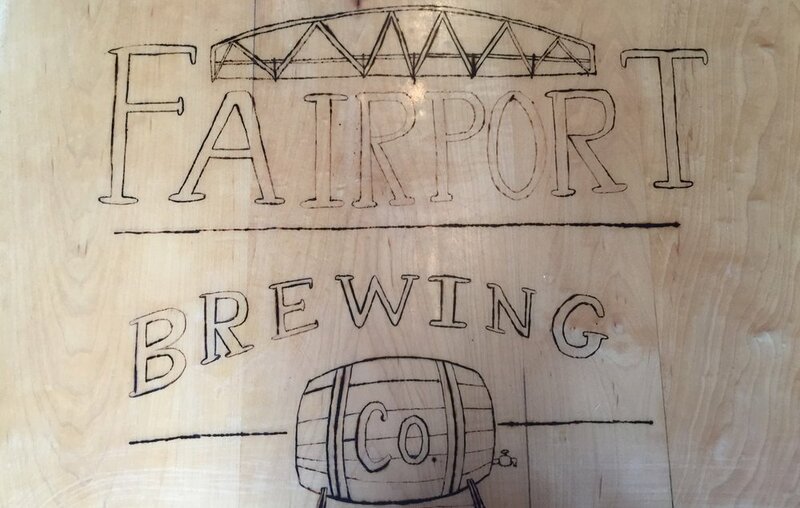 The Finger Lakes craft beverage trails are also home to several breweries, along with distilleries, and cideries. 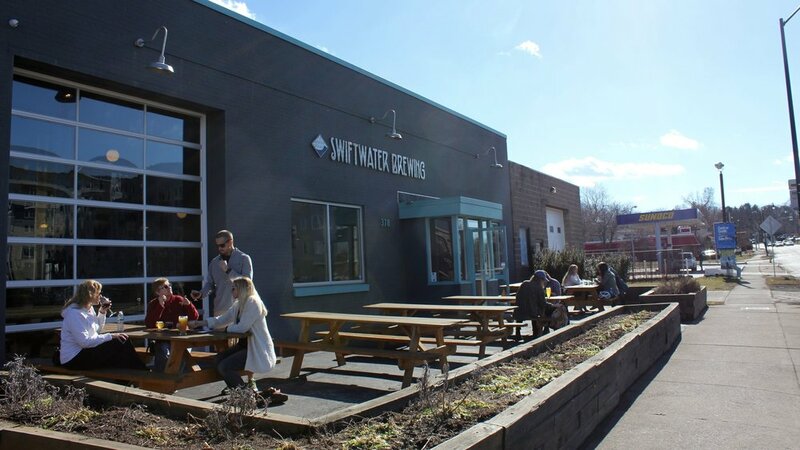 The number of breweries in NYS has grown tremendously and in recent news, the renowned Other Half Brewing has joined the Finger Lakes beer scene with a second location planned for East Bloomfield. 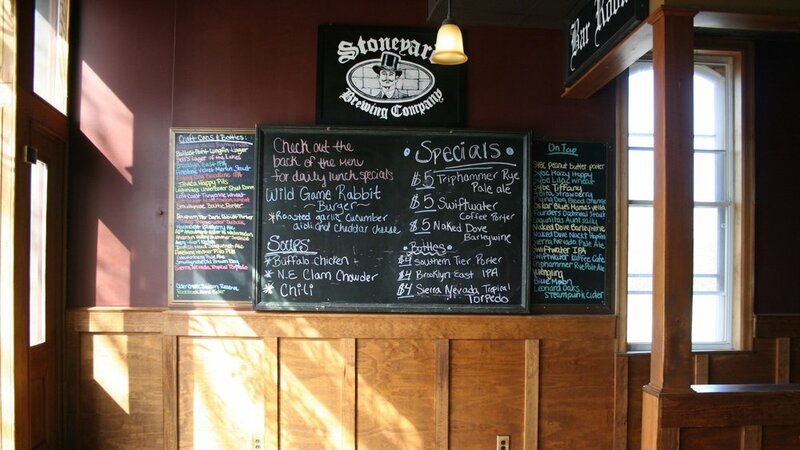 Nearby are Noble Shepherd & Irish Mafia Brewing Company for more beer tastings. 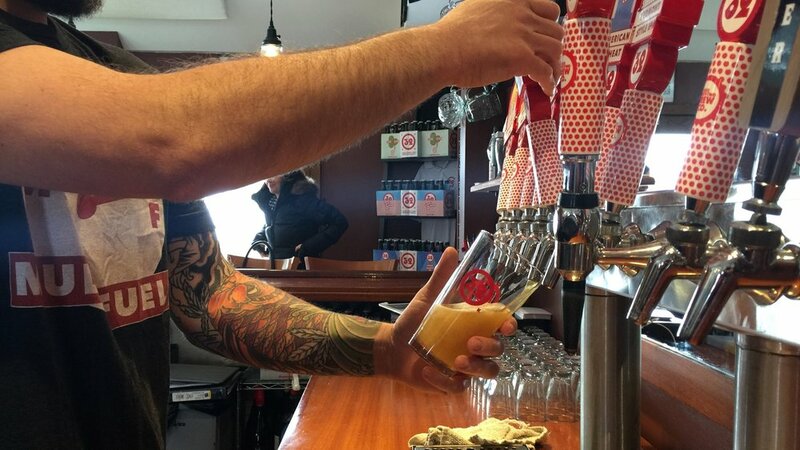 In the city of Canandaigua, you can also get a lakefront view and sip on beers at Young Lion Brewing or stop by the Heron Hill Winery tasting room that offers wine, cider, and spirits! With so many wineries, breweries, and more to choose from, you will need more than a weekend to explore the region. Start small to avoid getting overwhelmed and create your own mini tour. There are so many other fantastic wineries and breweries to discover on your own and get lost in. Surrounding the Finger Lakes is not only vineyards, but a solid array of farms and agriculture that hosts some of the best produce and livestock around. Our local chefs have used this to their advantage to elevate our culinary scene and create farm-to-table dinners that will rock your world. Located in Geneva’s historic downtown you will find the cutest street in existence which also is a burgeoning food scene: Linden St. This is a food lovers’ heaven all on one tiny, walkable lane. You’ll find the award-winning F.L.X. Table, an intimate dining experience and voted in 2017 as USA TODAY’s Best New Restaurant in the country. You’ll need to make reservations in advance for this one. To understand what “Big Pimpin’ at FLX Table” truly means, read my fellow Rochesterian’s VinifeROC’s blog post for an insider’s perspective. A few doors down (from the same husband-and-wife duo Christopher Bates and Isabel Bogadtke) you’ll find, F.L.X. Fry Bird. A casual comfort food restaurant with some bangin’ fried chicken sandwiches (please get it on a waffle) and spiked slushies. Get cozy at Microclimate Wine Bar and taste both regional wines, international wines, and craft beer. Craft cocktails and Tiki Taco Tuesday (yes, you read that right) await you at the Linden Social Club or Sunday brunch at H.J. Stead Company (a marketplace eatery). Close by this area are countless restaurants offering delicious fare that take advantage of our seasonal bounty: Ports Café, Red Dove Tavern, Kindred Fare, and so many more gems. Eeek! I’m already drooling thinking of all the food you’re going to devour. Learn more about the restaurants that are iconic to the region and ones with lake views at the link here. 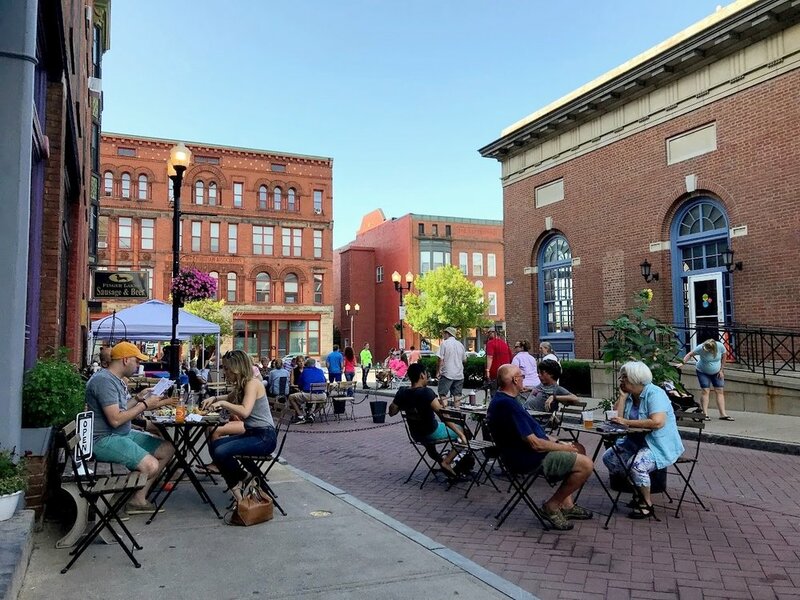 No need to leave your pup home as you explore the Finger Lakes—there is a whole slew of outdoor dining and patios and you’ll find many that are dog-friendly! Typically, pet-friendly spots will allow dogs outdoors (i.e., sidewalk tables or on backyard patios). Some offer water bowls or even special treats for your furry friend. Make sure to call ahead and confirm that dogs are welcome. Our Lab Shar-Pei mix, Harvey Specter, has come with us on many #FLX adventures and has befriended more locals than we have with that cute face of his. Here are pup-friendly spots that Harvey has visited or plans on visiting soon: Sand Bar (Inn on the Lake) in Canandaigua, Rio Tomatlan, Heron Hill Winery, Young Lion Brewing, Brews and Brats, Inspire Moore Winery and Grimes Glen Park to name just a few! The Finger Lakes has made it easy to bring him with us and ease our worrying on having to get home to let the dog out. A testament to the easygoing and inclusive nature of the #FLX Community. The Finger Lakes’ Ontario County is an approachable destination spot that will make you feel like you’re traveling abroad without breaking the bank. There is plenty to do, to see, to eat, to love. In fact, there are many things that you can do for free or with minimal expenses. One such thing would be to have a picnic on Bristol’s County Road 12 Overlook (featured above) on the way to Naples. I witnessed a proposal taking place here over a year ago (cue the waterworks). Take advantage of the free bikes from Lynnie Lou’s to explore the local area and try their homemade ice cream and custard. There is hiking nearby at Grimes Glen Park to view cascading waterfalls, again FREE. For all you hikers out there, this FLX region will be your paradise. There is an abundance of hiking trails and parks to visit, you can find more details here. You can see why it is so incredibly easy to fall in love with the Finger Lakes. The community here is proud of how the Finger Lakes began and what it has become. Thank you to the incredible tastemakers and doers in the #FLX community who make it possible for us to enjoy. The best advice I can give you is to not overschedule, give yourself enough time to relish and explore, and get to know the locals and the reasons they love the area. There is so much territory to discover across the Finger Lakes—not just in Ontario County, but beyond as well around Keuka Lake, Cayuga Lake, and more. Don’t be afraid to get lost in the beauty! For more ideas or to plan your trip, browse through this interactive guide from Visit Finger Lakes that provides ultimate insider tips on where to visit, best foodie experiences, lakeview dining, wine and craft beverage trails, and more! Below is a sample weekend guide to spark some ideas for all of you. Thank you for reading and I can’t wait to hear about all of your adventures! 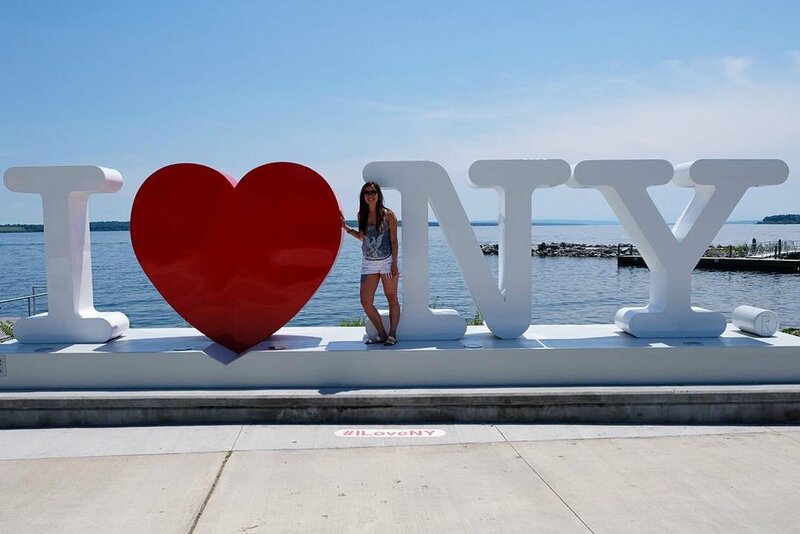 Tag us @sirrochasays, @visitfingerlakes in your posts and use the hashtags #FLX #FLXperience so we can travel with you. *Make sure to explore the many other wineries and breweries! Visit Geneva's Historic Linden St.